Seville Quarter’s Lunch starts at 11a.m. in the Apple Annie’s Courtyard with beautiful skylights and home to one of the city’s best soup and salad bar, with over thirty items to choose from, plus a nice selection of sandwiches, pizzas, burgers, wings and fresh local seafood. Our staff is eager to make your lunch a great experience, whether you’re tight on time or at leisure. We are confident you will be pleasantly surprised with the quality of food and service you will receive at a great value. 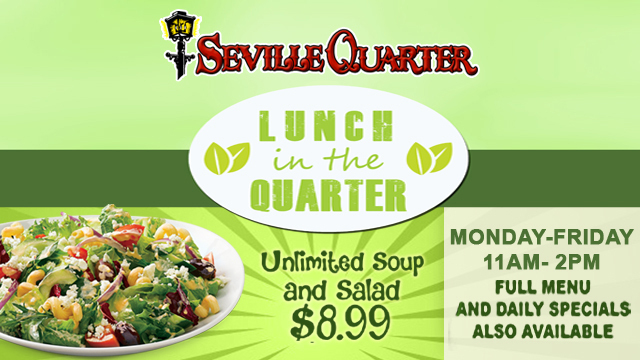 Reward yourself with a lunch at Seville Quarter, conveniently located in historic Downtown Pensacola.